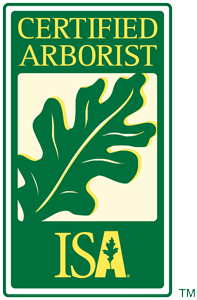 Plant Species Information Archives - Proper Landscaping Inc.
One of my earlier blogs showcased my plant ID picture book specifically targeting strata landscape plants. New workers would come on and they would ask me the same plant identification questions over and over. Now, as a landscape supervisor, I’m paid well to help out as much as I can. But it does get repetitive. 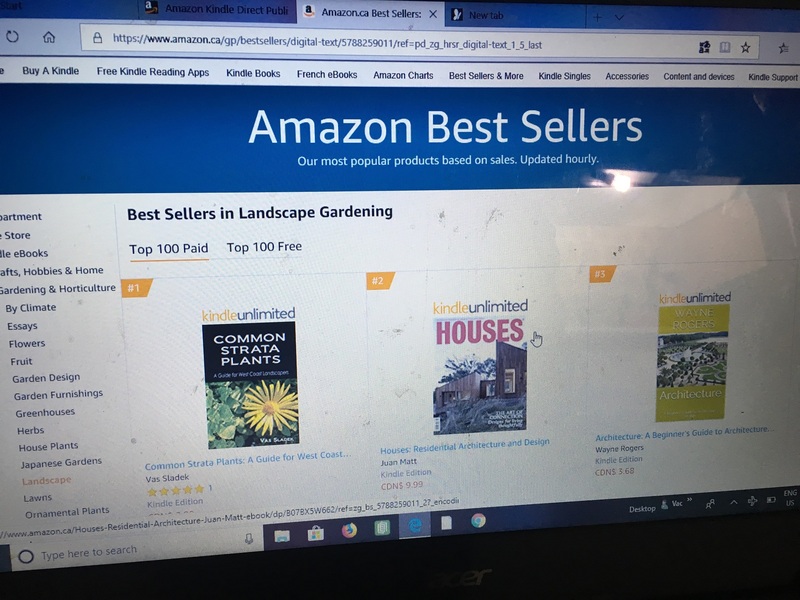 So I self-published an eBook on Amazon’s KDP with 100+ of the most common strata landscape plants. It took a while but the whole thing finally clicked with a new worker last week. 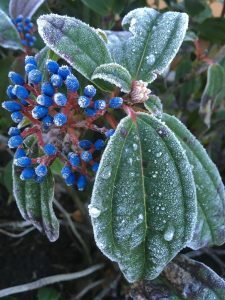 She stared at a Viburnum davidii shrub and asked me if it was a Portuguese laurel (Prunus lusitanica). No, it wasn’t. Then she sighed and expressed her frustration with plant identification. And I was ready! Why get frustrated when I put together an eBook for people like her. It’s nothing special. It’s just a simple picture collection of the most common plants we see on our strata (multi-family) sites. For the price of one regular Starbucks coffee you get a list of plants you’re guaranteed to see on your work sites. No tropical plants or vegetables, no fluff to waste your time. Once you cover the basic 100+ plants, you should be good to go. Yes, the plants don’t repeat completely but I can handle questions about beautiful Ligularias. Viburnum davidii are fairly common. So the girl went home and bought a copy of my eBook. It’s a simple process and it’s extremely cheap. 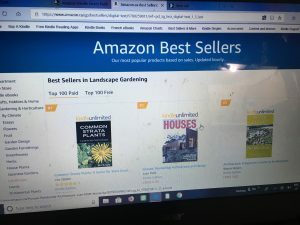 And every sale boosts my Amazon ranking, which is updated hourly. That’s why my Facebook post was called “#1 for an hour”. 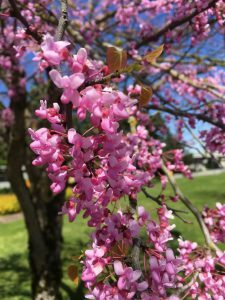 Plant ID is a critical skill for landscapers. 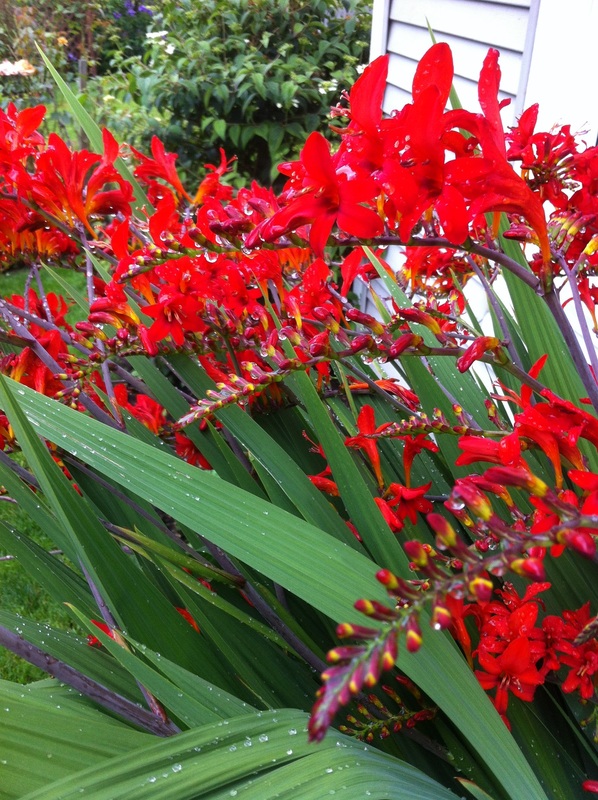 Knowing plants speeds things up on site and avoids many embarrassing mistakes. It’s also something bosses expect you to have. After all, this worker wants to be in a foreman position next year which will lead to better pay. I will help her as much as I can, now that she’s my “client”. I’m really happy that this whole thing worked out the way I envisioned it. I love sunny spring mornings. The plants look great in the sun and the mornings are still cool enough for me to thoroughly enjoy. Yes, the landscape is finally alive. I dream of these days when I work outside in the winter landscape. So let’s take a look at a few common plants I shot with my iPhone in the sun. 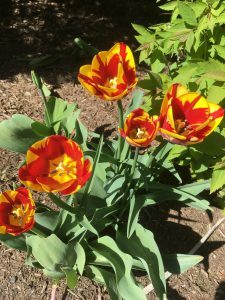 Tulips don’t come back reliably every year so try to change them. Have some fun and experiment with different color combinations. I love this yellow red variety. It’s a riot when Rhododendrons are in full bloom. 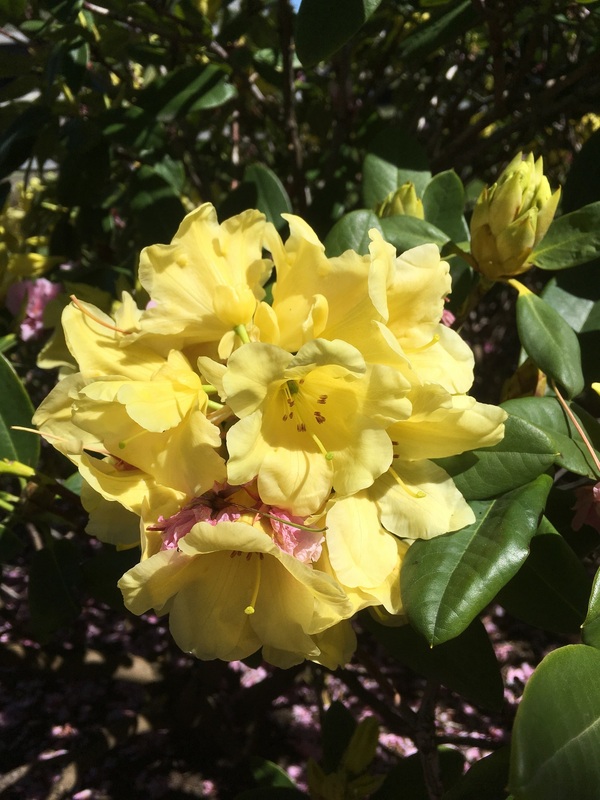 I don’t see too many yellow flowered Rhodos. Bergenia cordifolia is a fantastic perennial. I even devoted a short blog post to it. 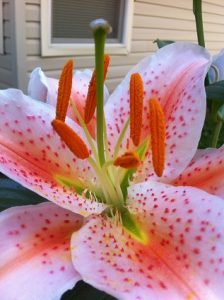 Enjoy the flowers and then just clip off the flower stalk when the show is over. Ribes sangiuneum has attractive early spring flowers. 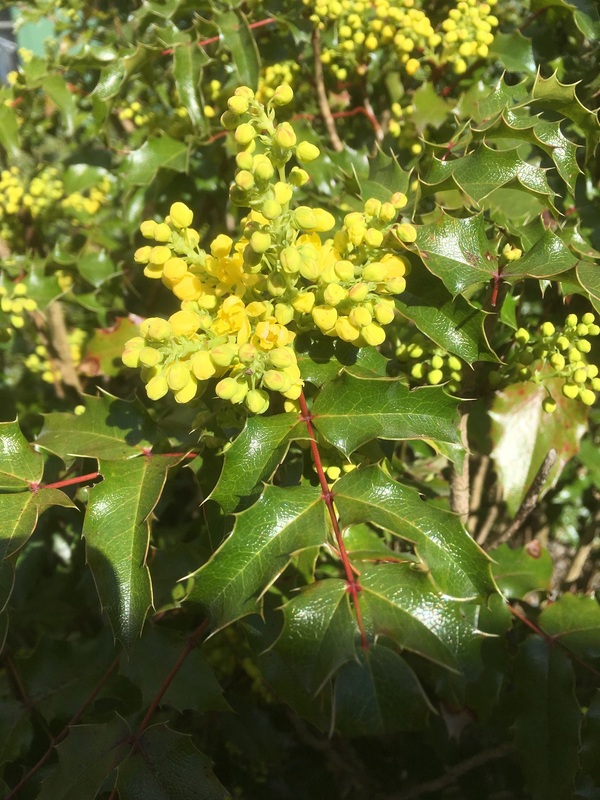 Mahonia aquifolium is a common landscape plant with prickles on its leaves. I like the warm yellow flowers on this landscape workhorse. 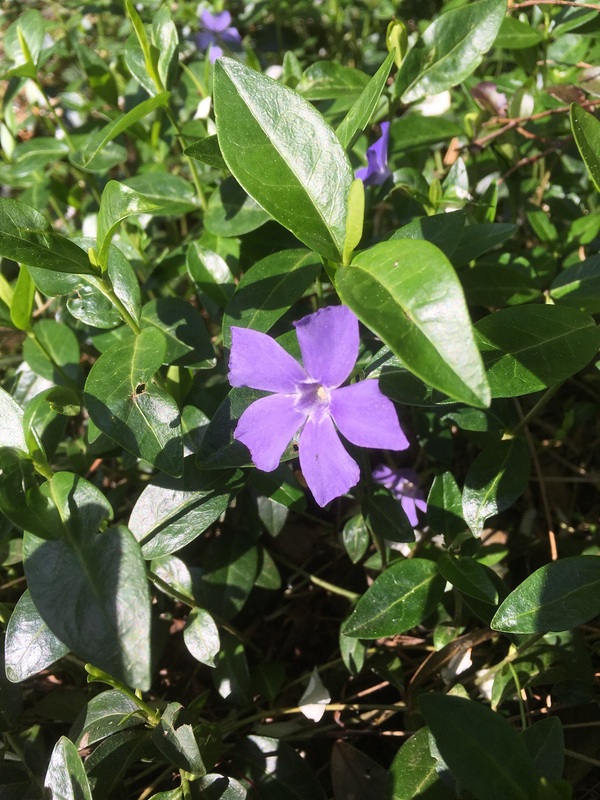 Vinca minor is now considered an invasive groundcover plant but the purple flowers are attractive. I have salvaged Vinca in pots on my patio and they work well there. Garden centres still sell them. 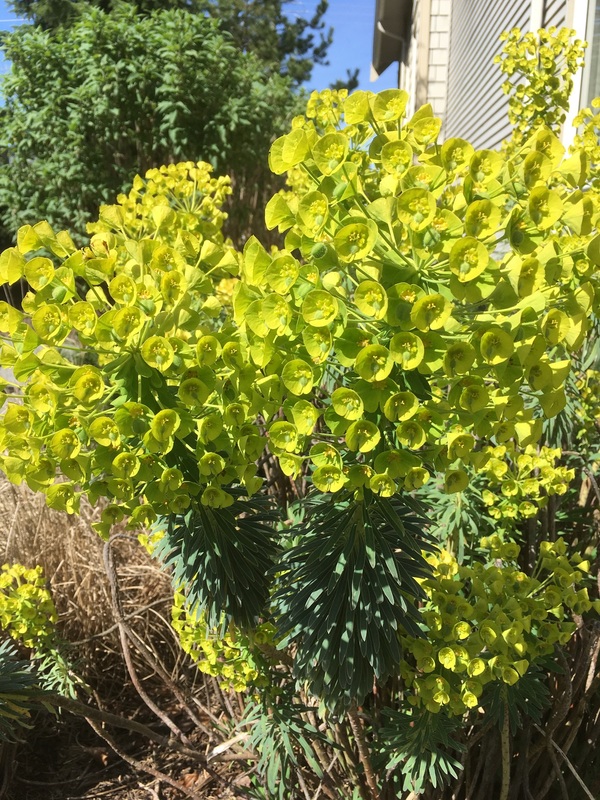 Euphorbia hybrid cvs. 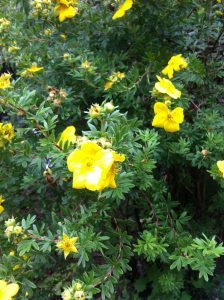 is hard to miss in the landscape because of its prominent flowers. 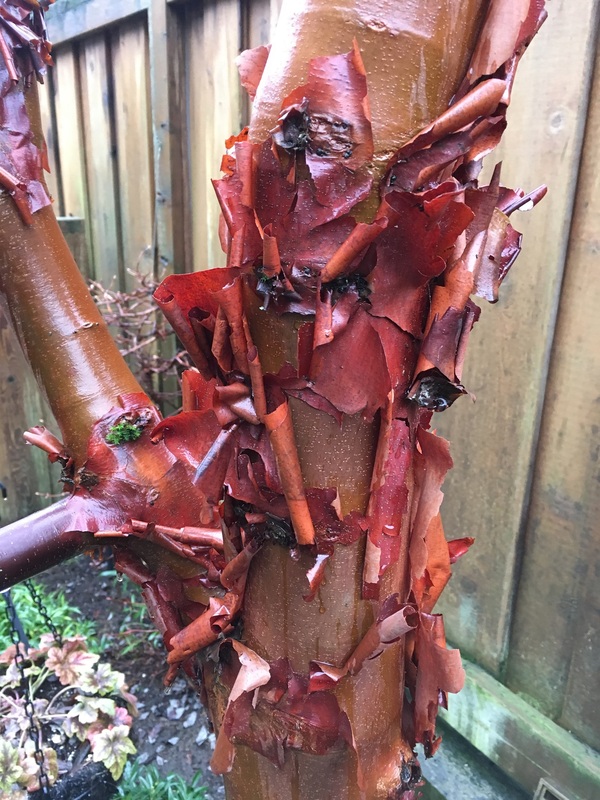 If you have to prune them you will discover the sticky white sap that courses through the plant. Japanese maples (Acer palmatum) are landscape all-stars. I love the reddish leaf margins. Katsura trees (Cercidiphyllum japonicum) are stunning in full bloom. Magnolia trees are also flower champions but sadly the flowers don’t last very long. In full bloom the trees are stunning. 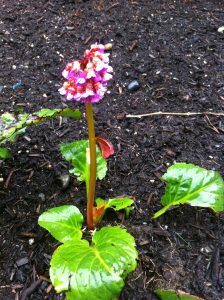 What’s growing in your garden? 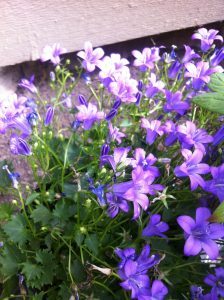 What are your favourite plants? Feel free to post a comment and share your favourites. I’m looking forward to working in more spring sun this week. What’s so special about Heavenly bamboo? First visits on new contract sites are exciting because you never know what you will find. Chances are only the big boss has seen them. 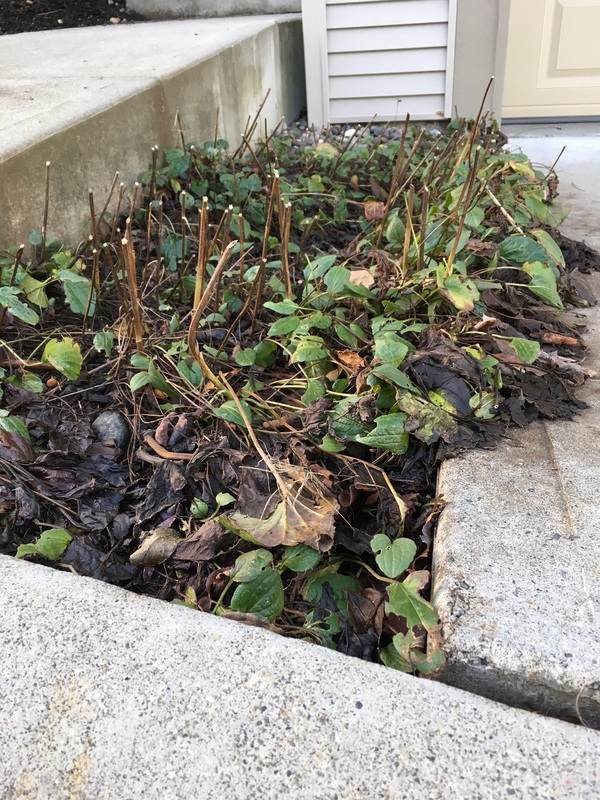 But as far as plants go, you shouldn’t expect too much because strata complex plants in British Columbia’s Lower Mainland tend to repeat. 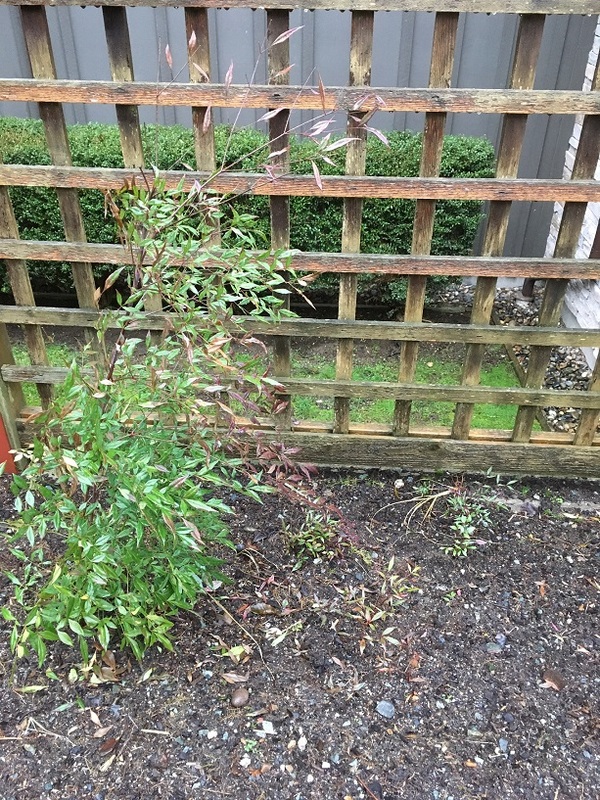 So when I recently worked on a new site I was surprised to find many heavenly bamboos (Nandina domestica). And I mean many. I almost feel like the shrubs were on sale when the site was built. Which bring me to a question. 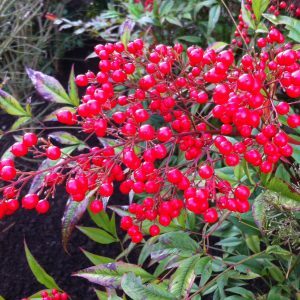 What’s so special about Nandinas? 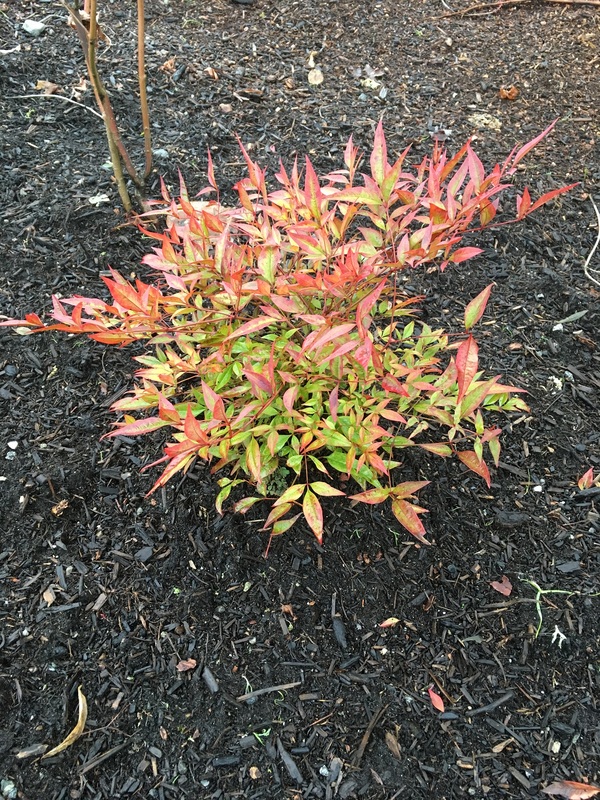 Nandina domestica is an upright, suckering evergreen shrub for moist, free-draining soil and full sun in a sheltered position. On strata sites there is definitely sheltering. Except I guess for boulevard corner beds. 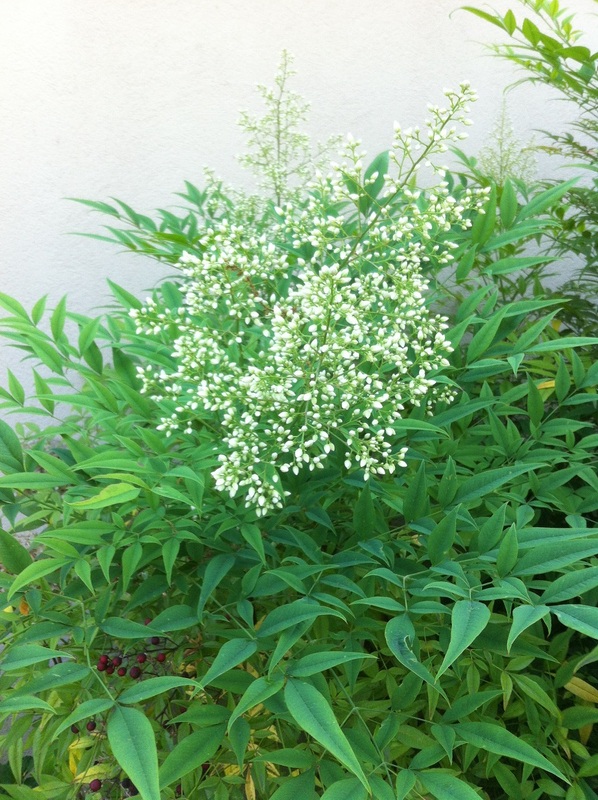 Now for the obvious ornamental features: summer white flowers turn into red berries. 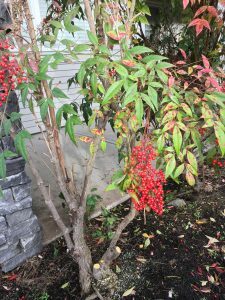 The plant is grown for its red berries. 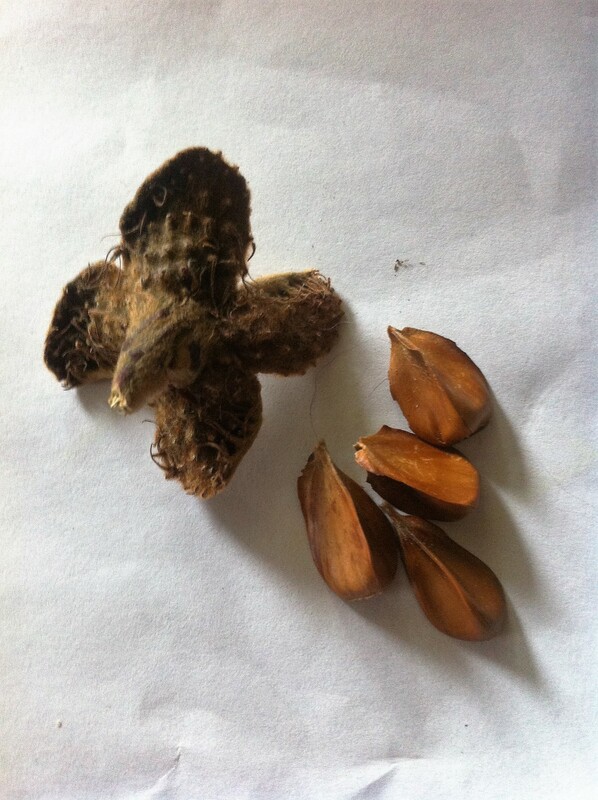 Also, note the pinnate leaves. Vigorous growth is produced from the base. This explains the suckering that goes on. Newly planted shrubs branch freely and this bushiness should be encouraged. Note the suckering that’s going on to the right of this Nandina. 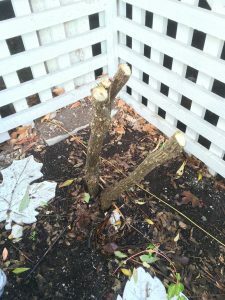 Pruning can be done after a harsh winter and for shape. I gently snip the tops to bring the height down and cut out any stems that go side-ways. Sometimes, long, unbranched stems are also thrown up through the plant. The correct procedure is to cut them down at ground level. If you prune them down they won’t break from your pruning points. Note the growth at ground level. Cut down the stems there and start over. This pruning doesn’t work. 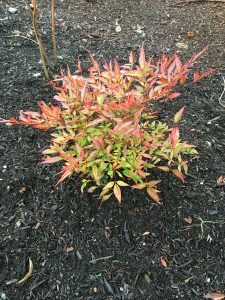 Nandina won’t re-grow from the cut points. I cut these stumps right at ground level hoping they will re-grow from there. We will see in spring. Nandinas are fairly common shrubs on strata sites. 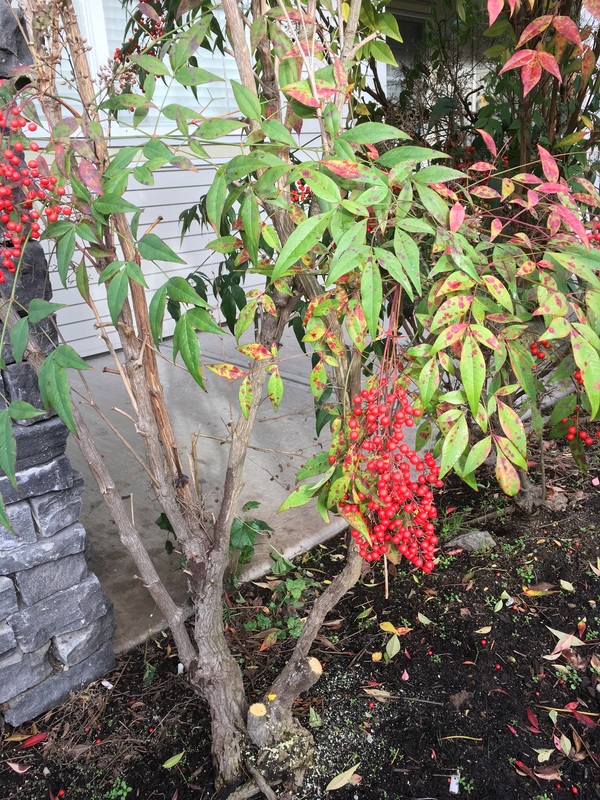 I think the pinnate leaf and red berry combination is nice. But on this particular site the planting was a bit overdone. 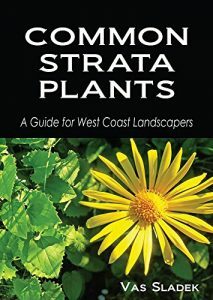 If you’re curious about what grows on your strata site you can purchase my pictorial guide on Amazon. January is the slow season in West Coast landscape maintenance but you can still have some fun by noticing landscape plants around you. 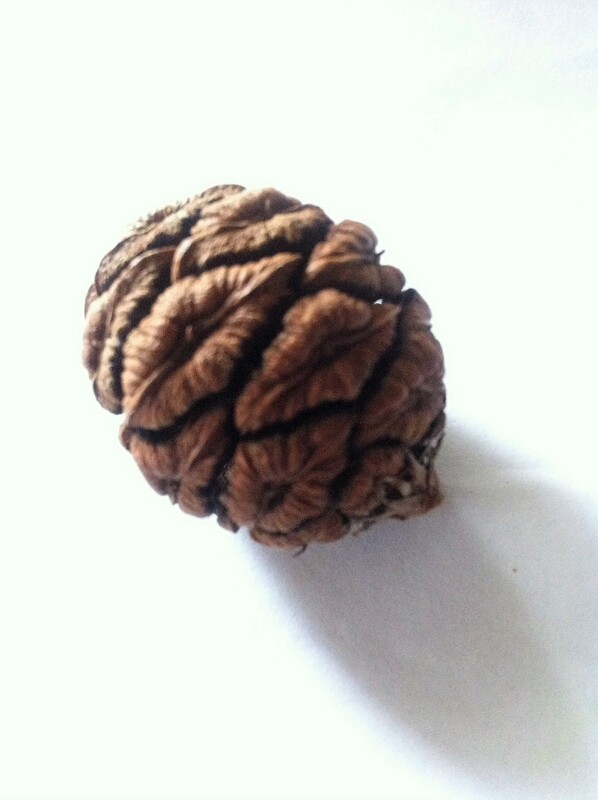 They may not look their best but it’s great to examine them in winter. I still remember the shock of noticing the black berries on Black Mondo grass. 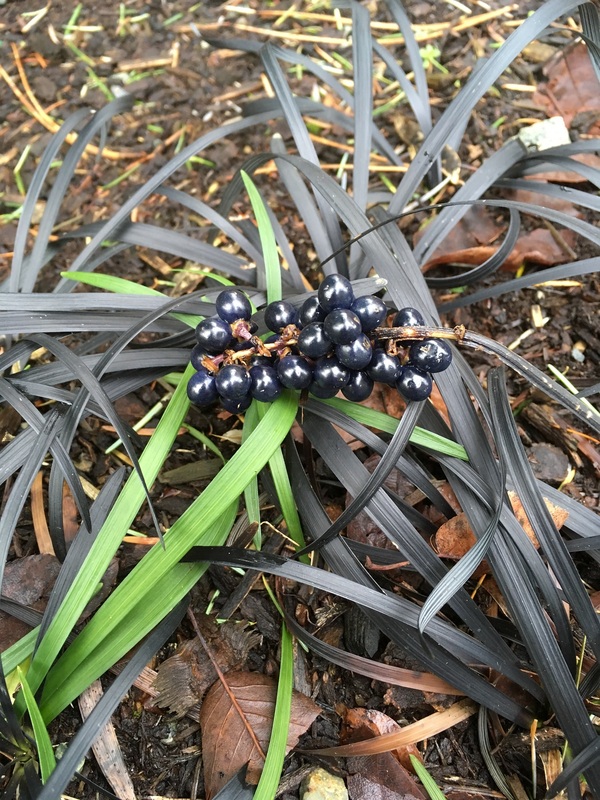 I knew the plant but I never stopped to notice the berries. And that was just last winter, after many seasons of landscaping. 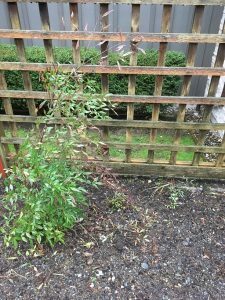 So let’s take a look at some of the plants I noticed on my strata sites. 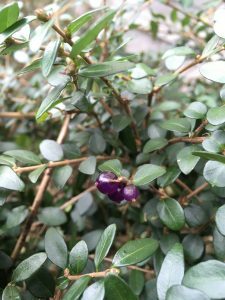 Lonicera nitida sports nice purple berries but they can be hidden so stop and take a longer look. 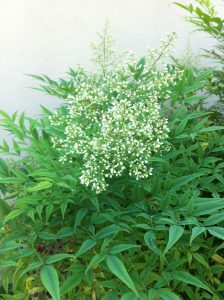 It’s a neat, evergreen shrub. It’s commonly sheared in tight spaces. My task was to remove ivy that was growing through it. 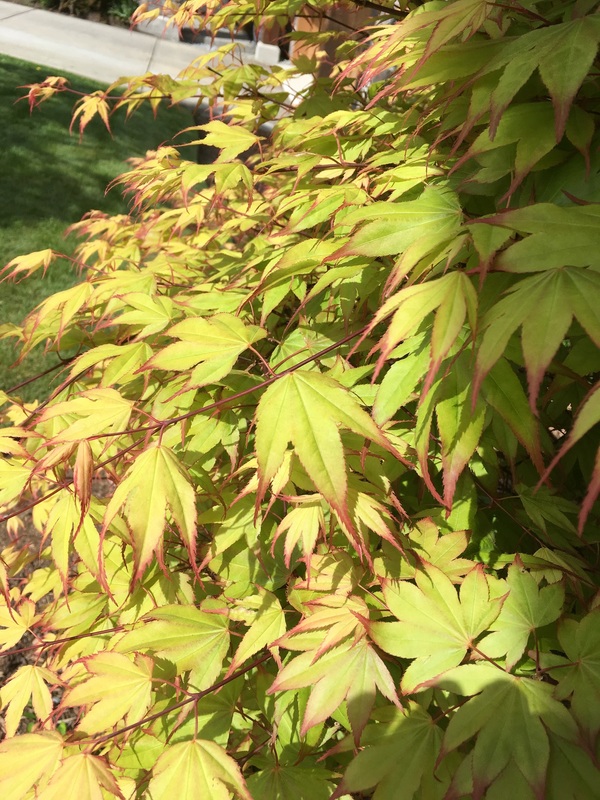 Acer griseum. This is one of my favourite trees because of its cinnamon coloured peeling bark. I never get tired of looking at the bark. Viburnum bodnantense. 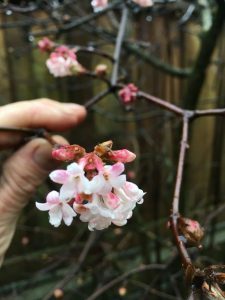 This Viburnum is a treat in winter. The white and pink flowers are hard to miss on its bare branches. 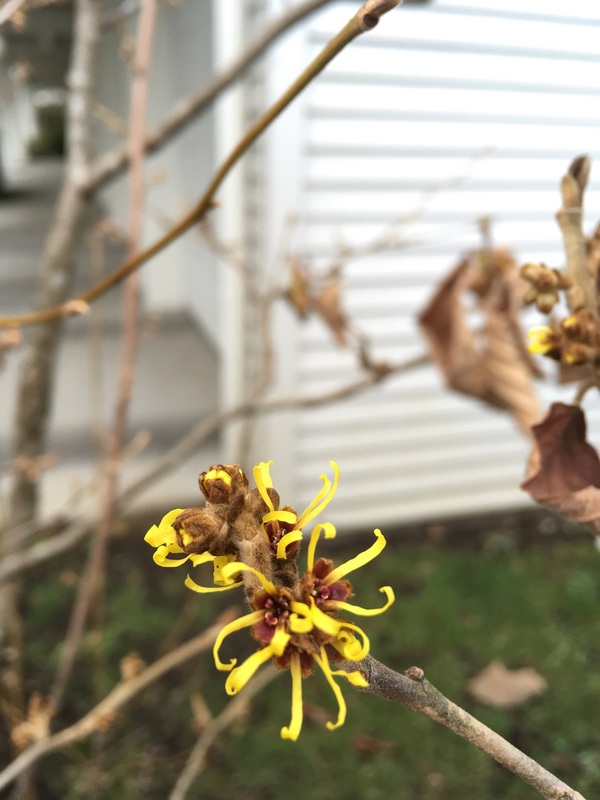 Hamamelis mollis. Like the Viburnum above, these yellow flowers are a treat to see in winter. I normally hate spiders but the five spidery-looking petals look awesome. Cornus mas. 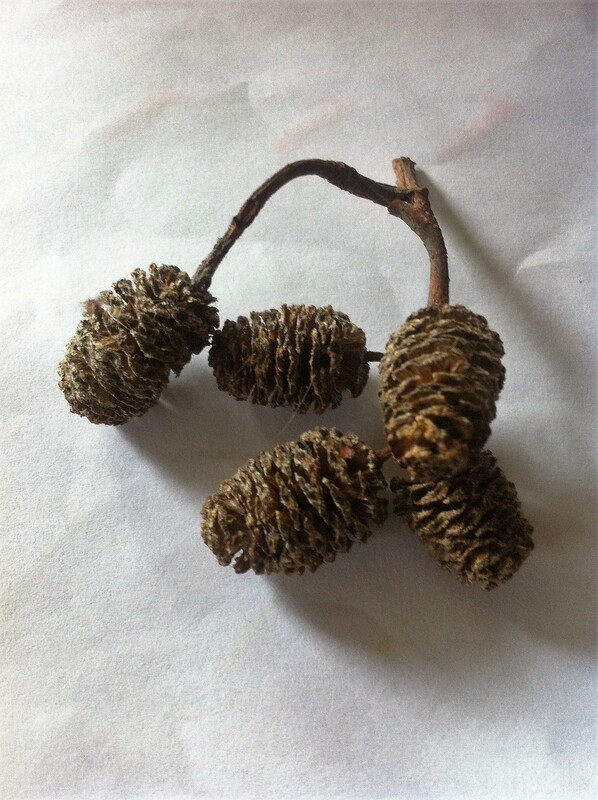 If you can identify this tree from the picture below you are doing really well. It’s Cornelian cherry. The edible summer cherries can be turned into jam. I usually just buy jam at Superstore. At this particular site, the residents consider the trees “messy” because people and pets step on the ripe cherries. I would never call a tree “messy”. It’s obviously planted for its ornamental berries (pictured above). 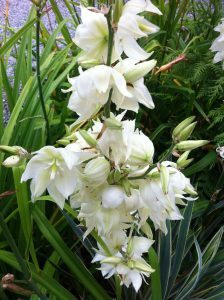 The summer white flowers are also nice. 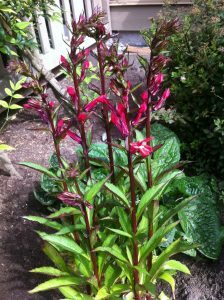 This common landscape plant will be featured in the next blog. Black plants make me laugh and I’m glad they exist. Black Mondo grass is one of them. 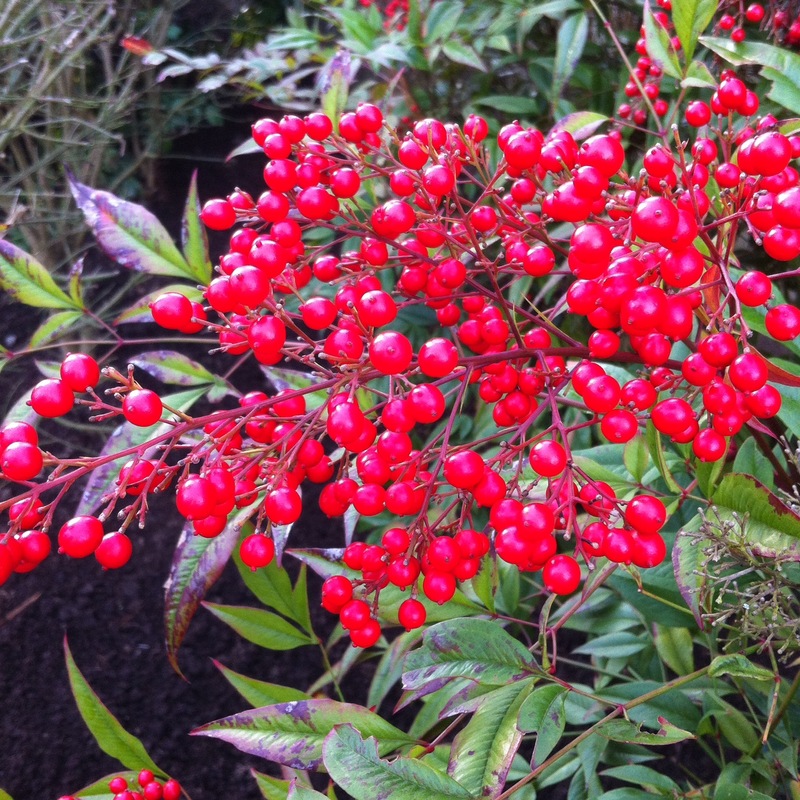 It’s a nice clumping border plant with ornamental berries. One fun project is seeing what plant combinations work with it. January isn’t exactly my favourite time of the year to be in the landscape but if you stop to look carefully, you can find some colour. 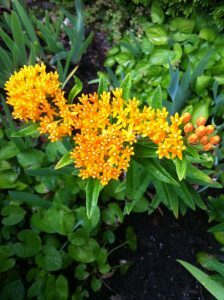 Take pictures and identify the plants you don’t know. Then think of spring. To help strata owners and new landscape workers with basic plant identification, I’ve put together an e-book picture guide: Common Strata Plants. The point of the guide is that the plant list comes straight from strata sites. 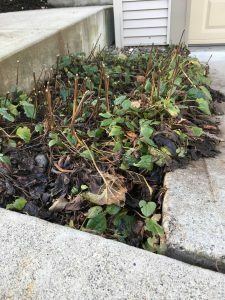 Once you learn the plants, they will repeat over and over on your other strata sites. I’ve done the basic listing for you. You can see my e-book details here. 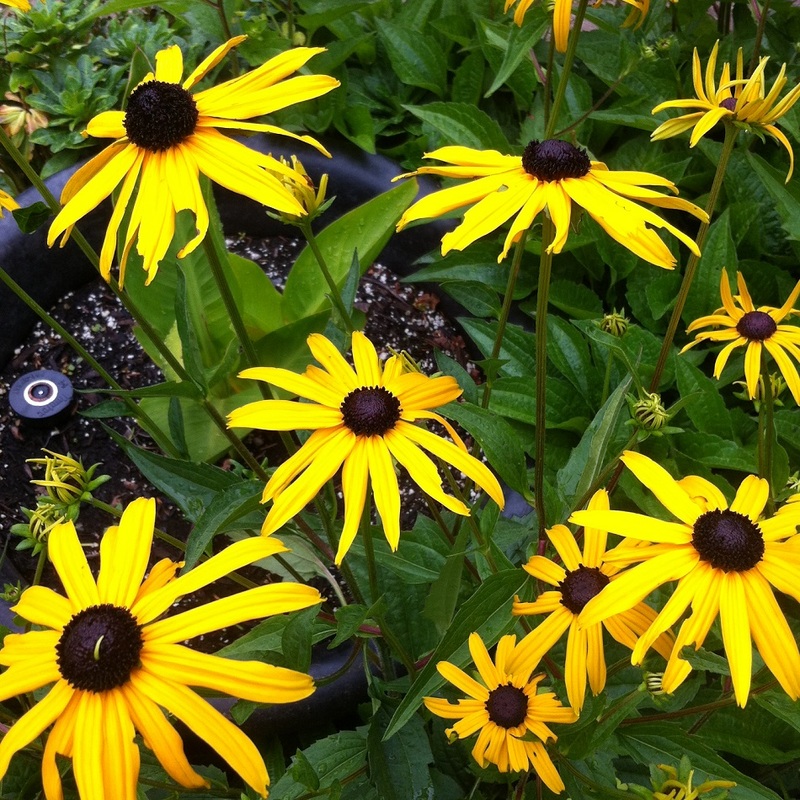 I love Black-eyed-Susans (Rudbeckias)! 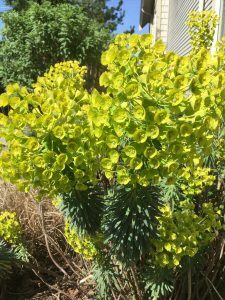 There is something mesmerizing about the yellow perennial flowers with black centers, especially when this perennial is mass-planted. But like Japanese cherry blossoms, it’s a bittersweet experience. Cherry blossoms are beautiful but sadly, they don’t last very long. Just like life. So enjoy the show and be glad you’re alive. 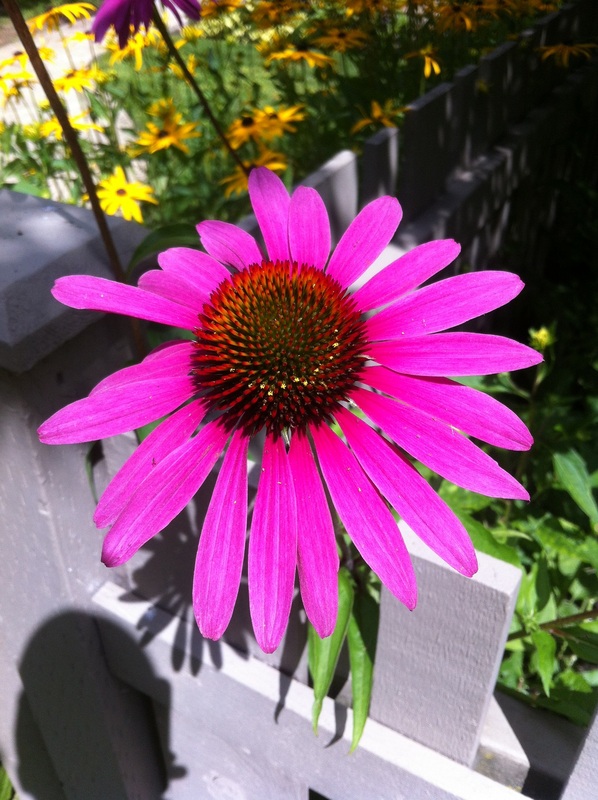 Rudbeckias, on the other hand signal the end of summer. 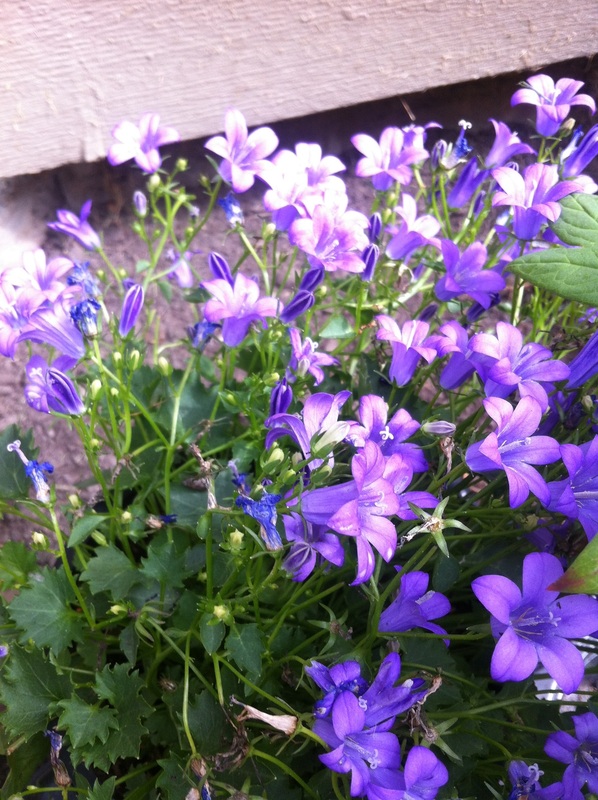 Once the flowers start fading you know summer is ending. 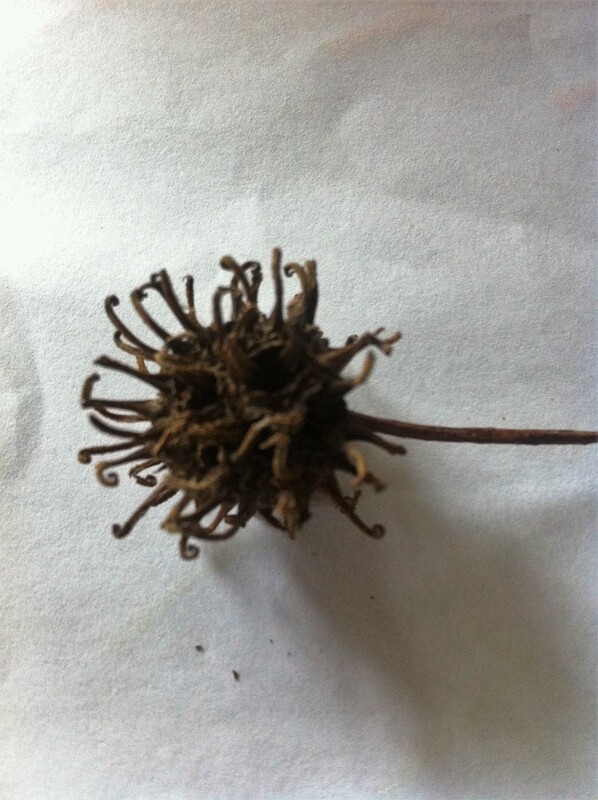 To save time, some landscapers gun down spent Rudbeckia stems with power shears. But since the leaves at the base still look good, the cuts are made high which leaves noticeable spikes. I absolutely detest this practice. And sometimes it gets worse. 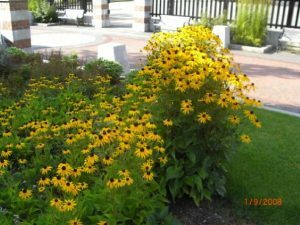 Landscapers, armed with line edgers, stop at a clump of fading Rudbeckias and proceed to shred the stems. When I witness this on site I openly discourage it. Sometimes I get so excited, I fail to express myself intelligently. I hate this look. 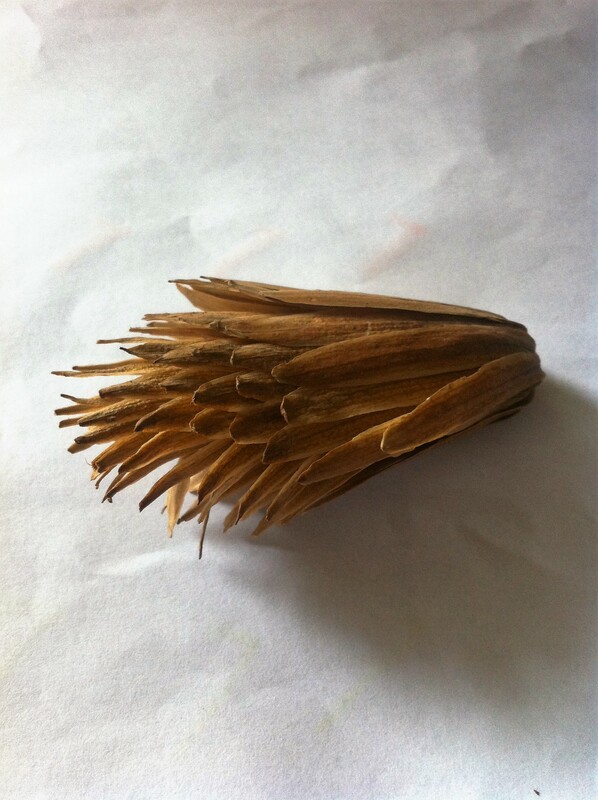 These Rudbeckia stems were sheared in late summer to save time. But once the leaves fade these ‘sticks’ are noticeable. 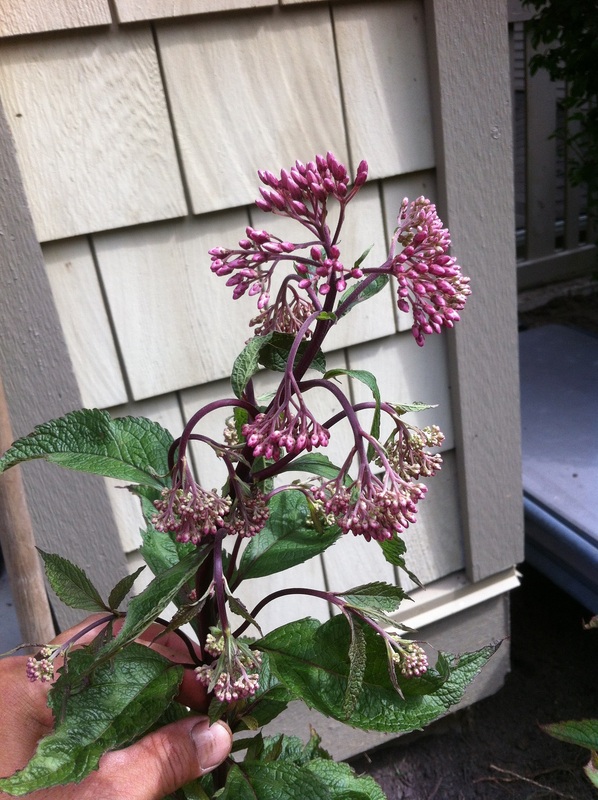 I suggest hand-snipping the spent flower stems so the cuts are hidden inside the greenery. One cut. There is a better way and it hardly takes any extra time at all. And even if it did take a few extra minutes, it’s like top class therapy. More about time later. It feels great to grab sharp Felco snips on a sunny fall day and dive into mass planted Rudbeckias. You can grab a handful of stems or do it one by one. And note the one important difference: the cuts are made inside the green leafy mound so we don’t get any ‘sticks’ poking up. These ‘sticks’ become even more obvious when the green leaves at the base fade. I had tons of fun doing it. 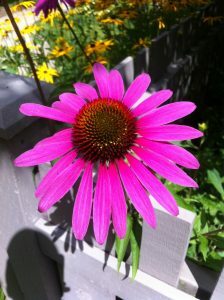 It was like a thank you job to the Rudbeckias for a great summer show. Minus machine noise and air pollution; and no shredding of stem tissues, just sharp cuts. If you’re like me and the winter look with sticks poking up bothers you, then you fix it. So really, the quick late fall assault didn’t really save much time. 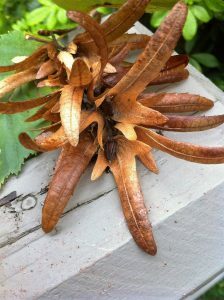 It’s much better to make one nice deadheading cut by removing the stems from inside the leaf base. One cut, not two. And you get quiet therapy to boot. I remember those sunny afternoons well. Sun, sharp Felco snips and gorgeous Rudbeckias. 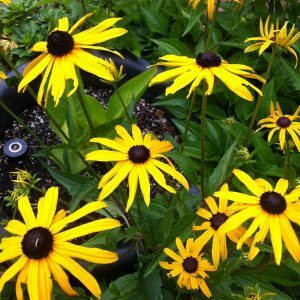 How do you deadhead your Rudbeckias? 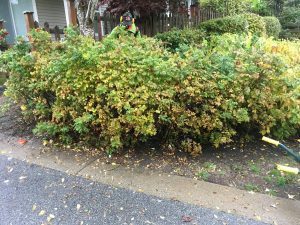 I heard recently about a case where one landscape maintenance foreman pruned a lot of stuff on his site. 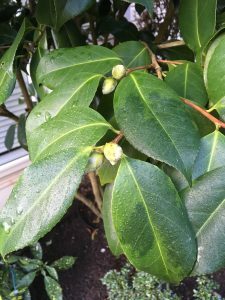 Including Camellia japonica full of flower buds. 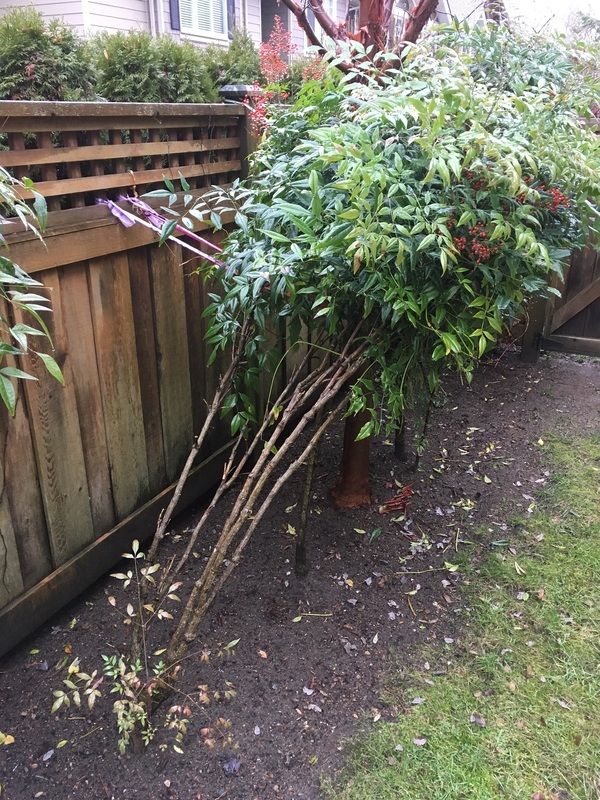 The owner loves her Camellia and she was extremely unhappy about losing so many buds to needless pruning. Oops. 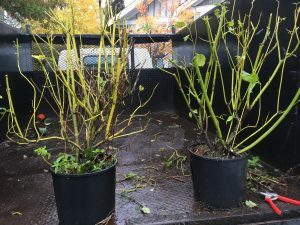 Pruning involves correct technique and timing. Normally we use hand snips or power shears and both are fairly easy to use. I prefer to use hand snips whenever possible because they are quiet. 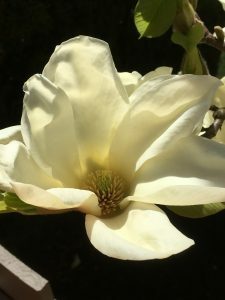 Timing depends on the specific shrub or tree in question and thus requires plant-specific knowledge. That is both exciting and scary. 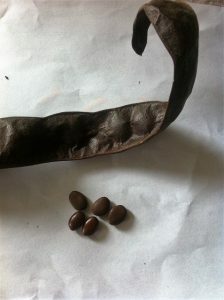 All top horticulture professionals have a lot of plant-specific knowledge which takes time and experience to acquire. Then this week I helped with the last service of the season at a Port Coquitlam site. And there it was again. Another Camellia japonica and a passionate owner used to enjoying her flower show. And I was ready. The timing of the request was way off. 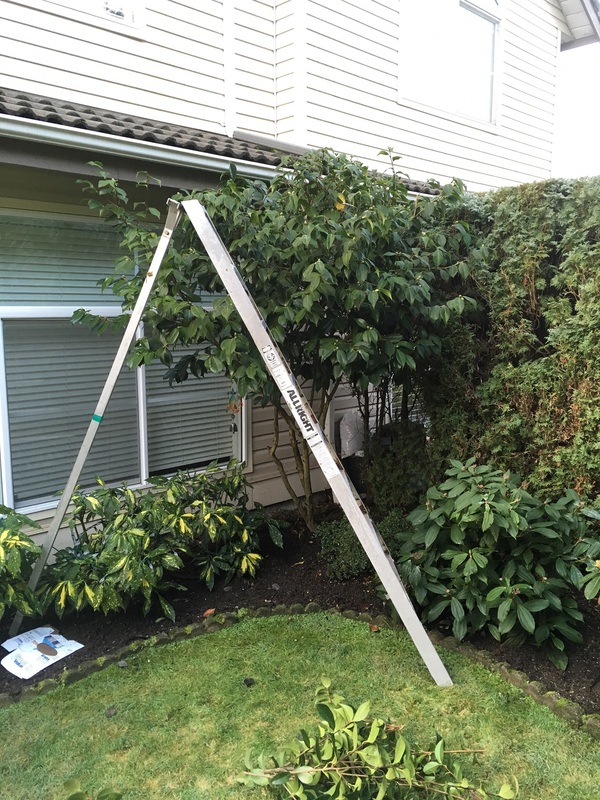 December is not the right time to prune Camellia japonicas. The only thing I really power shear in December is cedar hedges (Thuja occidentalis ‘Smaragd’). The proper pruning time for Camellia japonica is in spring, right before bud break, according to my Timber Press book “Essential pruning techniques”. 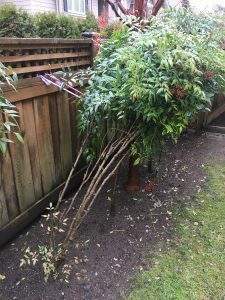 Camellias don’t really need pruning but this specimen had several shoots sticking up and the owner wanted them pruned. But only those shoots. So I hand snipped all of the shoots down to a bud. It was easy and it didn’t take much time. Power shearing would have been slightly faster but the shredding that occurs is unsightly. Hand snipping works perfectly in this case. 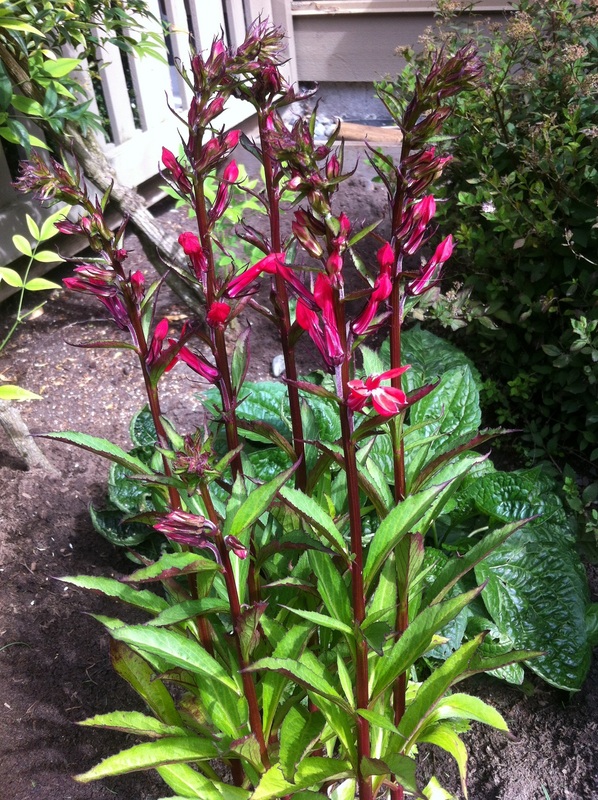 The task was to remove the long top shoots which don’t sport any buds. I made the cuts down to the first bud I encountered. This is the after shot. 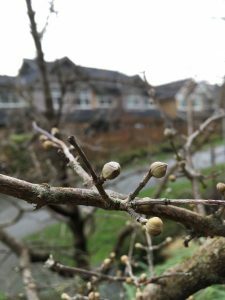 The long shoots are gone and very few buds were lost in the operation. 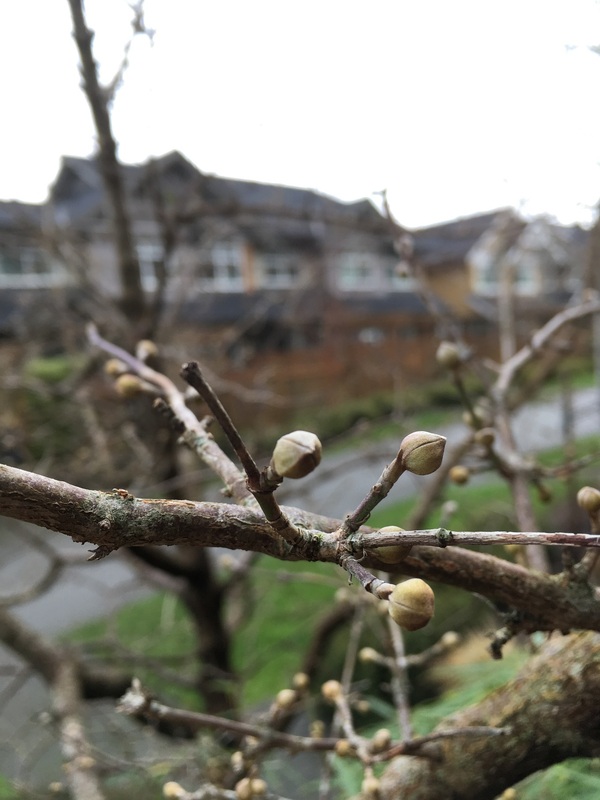 Any additional pruning will happen in spring, just before bud break. Camellia flowers are stunning and can be cut for home vases. You can see why owners would get upset over losing this kind of show. 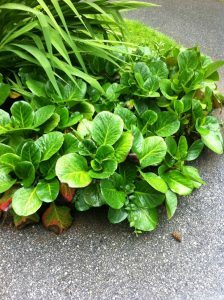 Remember to pick-up plant-specific knowledge so not everything on your site or garden is power sheared at one time. 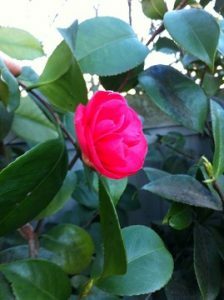 Camellia japonica should be pruned in spring, just before bud break; if you must prune it. 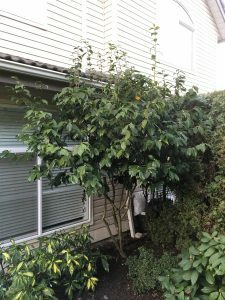 Sometimes owners get tired of the plants around their strata units and demand changes. With strata approval, of course. This blog post covers one such case. The owner was upset with Rosa rugosa spreading into his lawn. OK, no problem. We can do some editing. I love plant editing in the landscape. And as luck would have it, the morning storm passed and the sun came out just as I got to this project. I don’t love it and I don’t hate it. It sports decent enough rose flowers. It’s a rose so it’s prickly and it does spread. Since the planted area was situated under a red maple (Acer rubrum) the digging was awful. I had to cut away some of the maple roots just so I could extricate the rose. 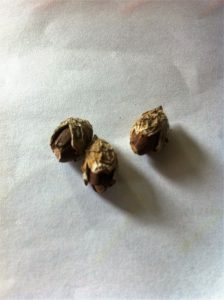 Rosa rugose, unwanted and despised for spreading. 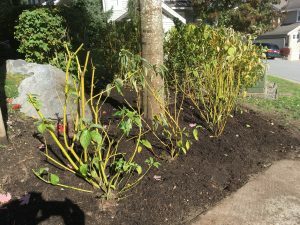 Since there was a patch of yellow twig dogwood already, it made sense to plant more of it. So we brought in six new specimens of Cornus stolonifera. 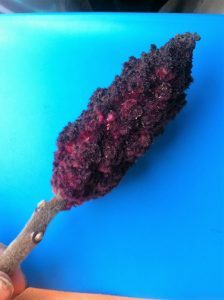 I normally prefer the red twig dogwoods but here we had no choice. Yellow twig it was. The plants don’t require any pruning but the potted plants had to be cleaned-up a bit. I removed some of the dead and anything low at the base. The dogwood on the right has been cleaned-up. 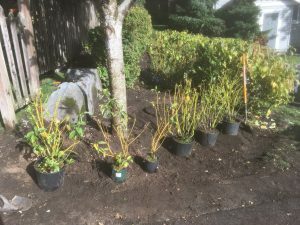 Once the plants were laid out, the planting was fairly easy. Just remember to rough up the roots before you stick the plant in the ground. Since the roots are circling in the pots, I make north to south cuts with my Felco2 snips. Don’t worry, the roots can handle it. The two smallest specimens were planted closest to the maple where the digging was the worst. Cornus stolonifera is a densely branched shrub with creamy white flowers; and creamy white fruit. It’s best mass planted. 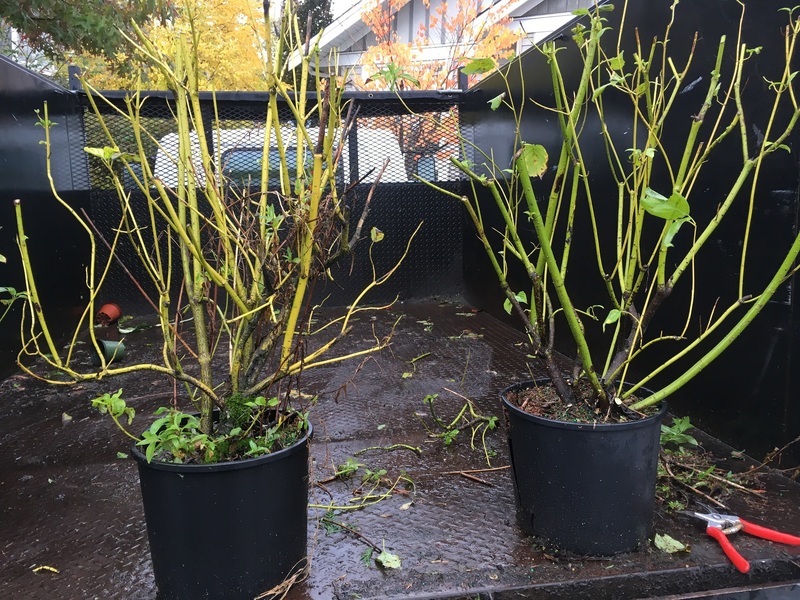 In this case we already had the same yellow twig dogwood on the right. The yellow twig dogwood grows 6-8′ tall and likes full sun or partial shade. It will get plenty of sun in this location. 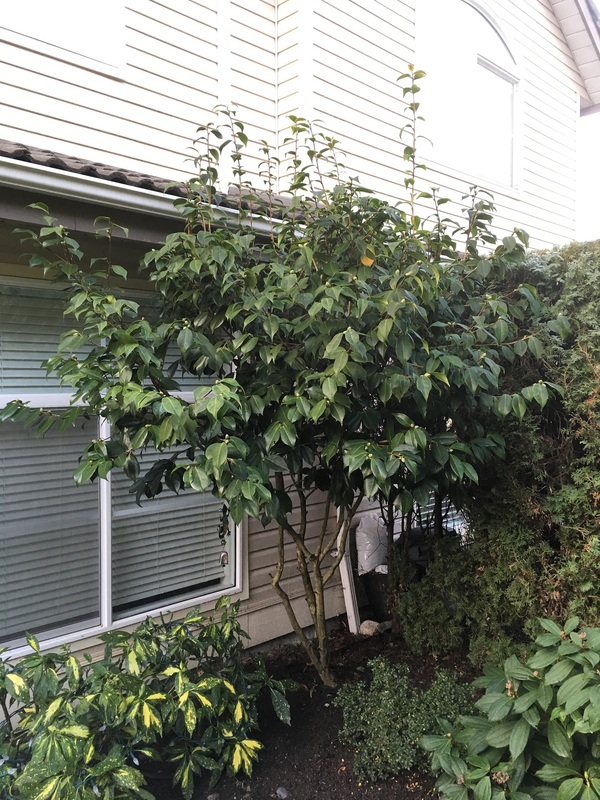 No pruning is necessary but since this is a busy strata unit corner, I know it will get sheared, eventually. It’s always a good idea to top dress new installs with soil. Here we installed half a yard of mulch for an instant sharp look. And lastly, a courtesy blow finishes the install. Always leave your work area clean. 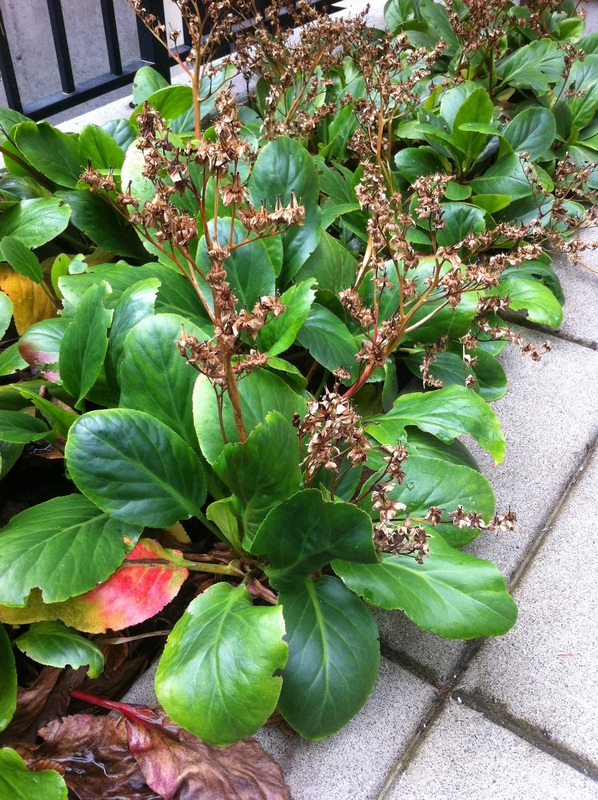 My first encounter with Bergenia cordifolia was several years ago with my manager. 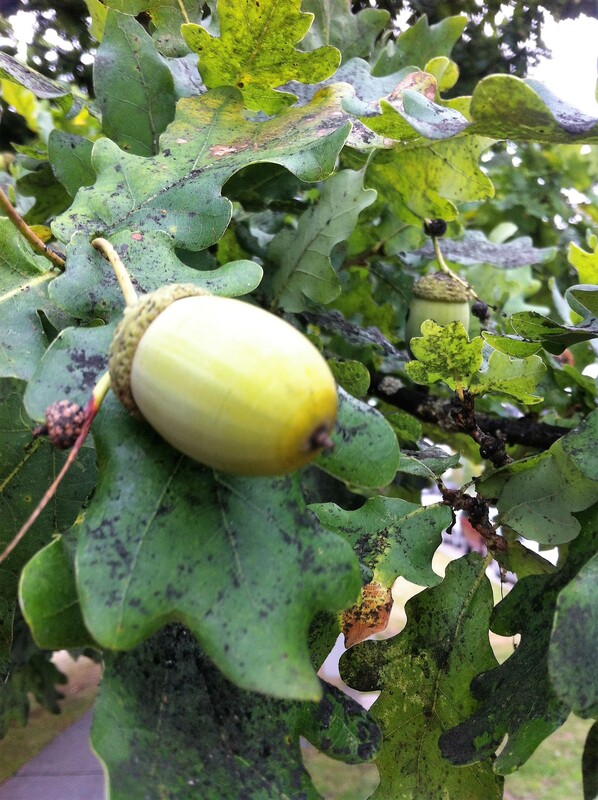 She bent down and furiously started rubbing the leaves to demonstrate how the plant got its common name ‘pigsqueak’. And so we all rubbed the leaves to learn our lesson. Some no doubt turned their thoughts to bacon. Fast forward to 2016. Out on a site walk with my boss and the garden liaison, I was shocked when the lady asked us about removing a huge clump of Bergenia. What? Really? One person decides on a large landscape edit? They obviously had not flowered yet and they were in a perfect location close to a sidewalk. 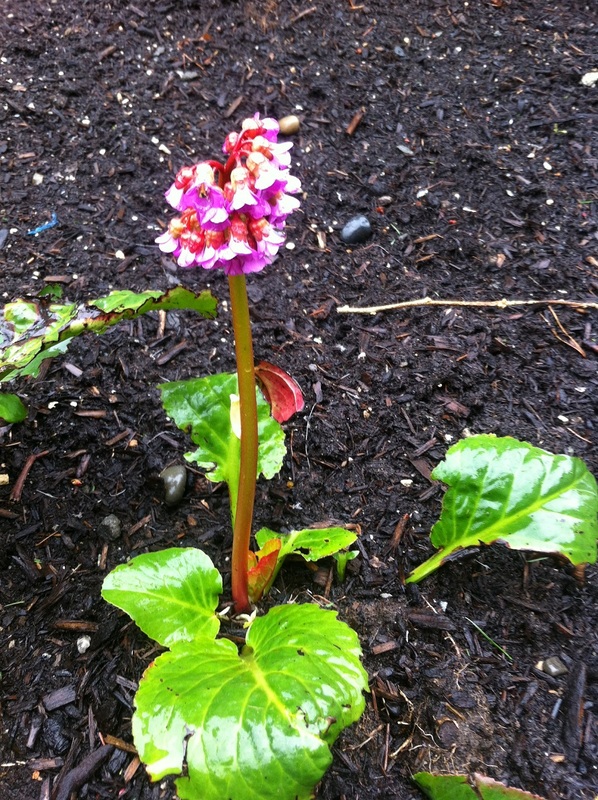 Bergenia form nice clumps but don’t spread quickly. Luckily the lady got side-tracked with other projects. Then, at home one day in summer, seeking happiness by de-cluttering, I ran into a clipping from March 2008. It was a Garden West magazine article by Carol Hall. In it she correctly defends Bergenias. Finally, one person that made sense. Let the pigs squeak. Forever. Siberia and Himalayas native, this early-blooming perennial is tough as nails. Once it is established, it requires very little maintenance. I remove any brown leaves before liaisons get upset; and I remove spent flower stalks. That’s it. Hall thinks that Bergenia’s lack of popularity stems from being stuck in 4 inch nursery containers. 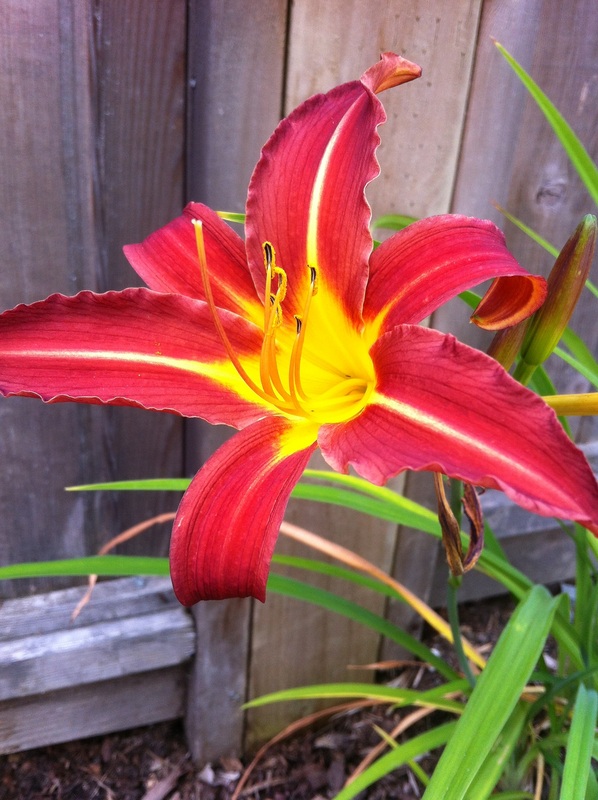 To fully appreciate the plant you have to see it established in your garden. I believe she is right. See my pictures below. 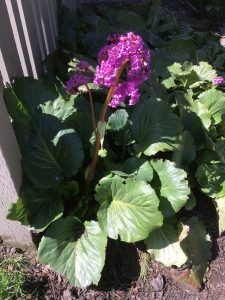 Other than situated by sidewalks, Bergenias are also good for front border definition and as year-round accents in mixed landscaping. 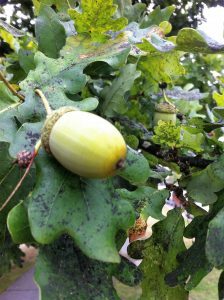 You can also mass them under deciduous trees. A salvaged specimen on my patio. Not much of a show but I love the leathery leaves. Much better in a clump. Note the only real maintenance: snip out spent flower stalks and remove any brown leaves. 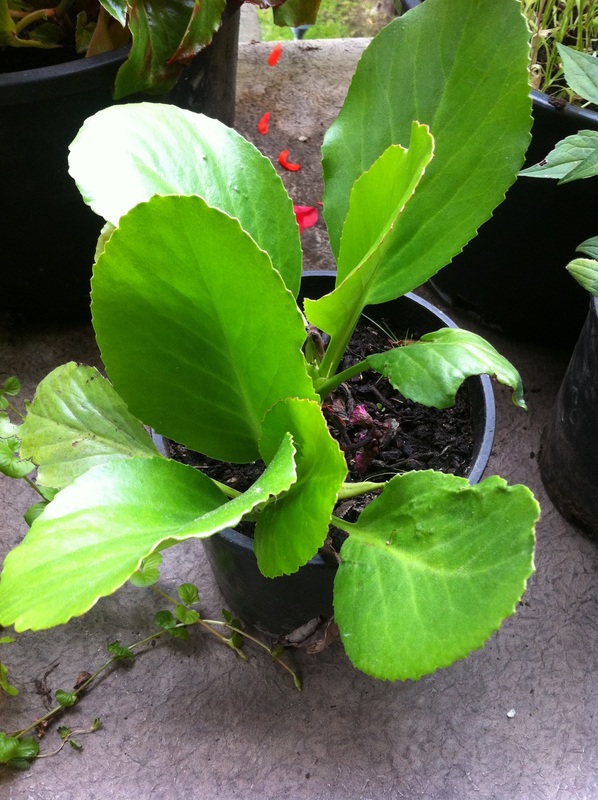 Give Bergenia cordifolia a chance in your garden. Summer colors rule! It’s a lot of fun working in July landscapes. These are the days I dream of on cold November days. Those dark wet days when I have miles of cedar hedges to prune and the only source of heat is the gear case on my shears. 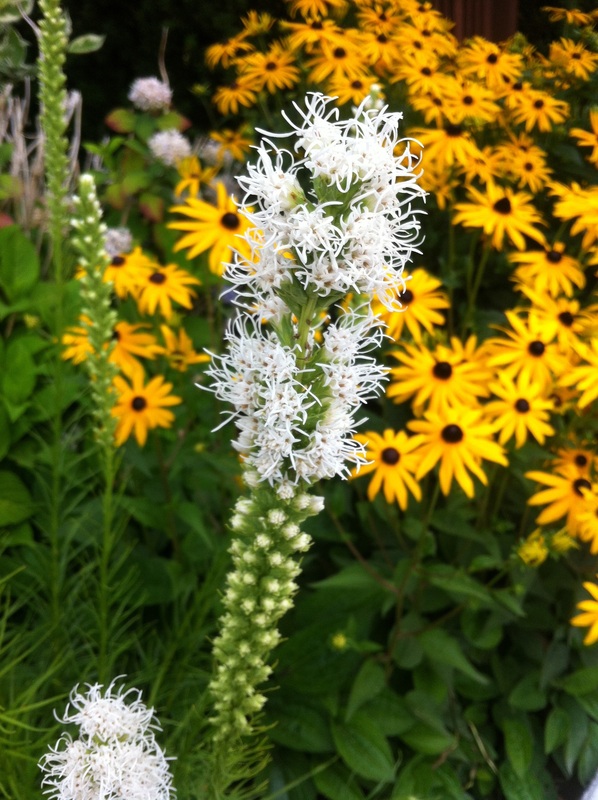 Mass-planted Rudbeckias are very warm and hard to miss; lilies are everywhere; and Liatris spicata demand attention. My favorite silk tree, Alibizia julibrissen, smells so great I get close enough for its silky flowers to tickle my nose. I even snipped off a few flowers, sealed them in a bag and brought them home so my kids could enjoy the scent. 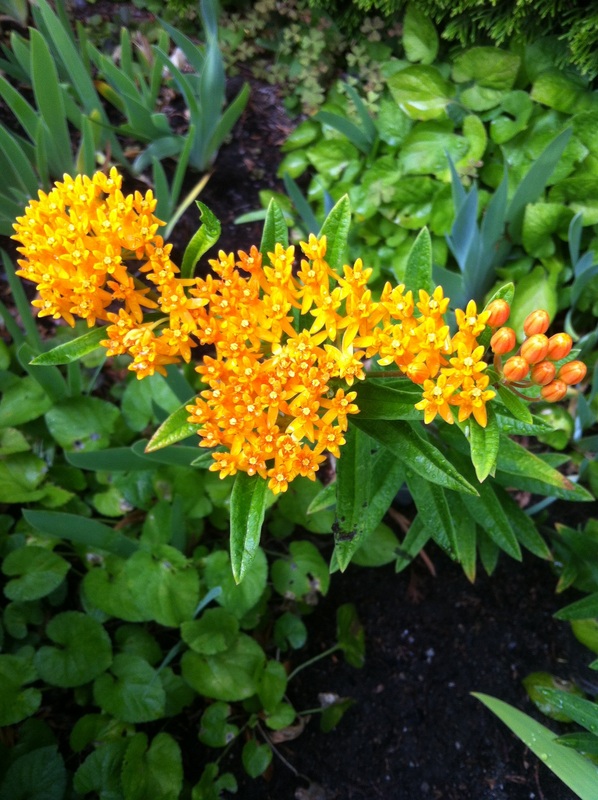 Below are plants I encountered while working in the landscape. The Hosta flower picture is my first ever. 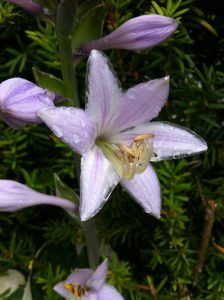 Until now I never photographed an individual Hosta flower. 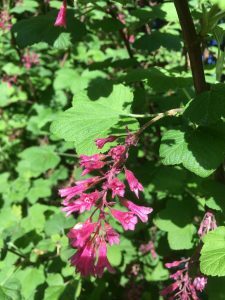 Summer is the best time for plant identification work. 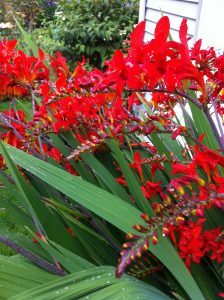 As you move through your gardens and landscapes look around. Can you name some or all of the species? When you encounter your favorite plant, look it up. 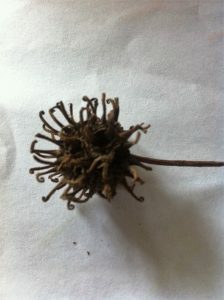 Most plants have their own stories and interesting details. Can’t name some? Take a picture and research them. Better yet, buy some plants and plant them in your garden. That’s the best way to remember them. When I install plants I always keep the tags. When I find discarded plant tags, I keep them. I also take pictures of tags in clients’ gardens. I try to stay away from garden centres because, inevitably, some tags of plants I didn’t know will end up in my pocket. That’s when teenage garden centre assistants roll their eyes and search for the manager. Lesson is over. I head for the exit.